Repsol Honda’s Marc Marquez kept his perfect pole record for the season intact, as the reigning World Champion set a scorching lap time of 1’37.683 in qualifying for the Argentina Grand Prix. 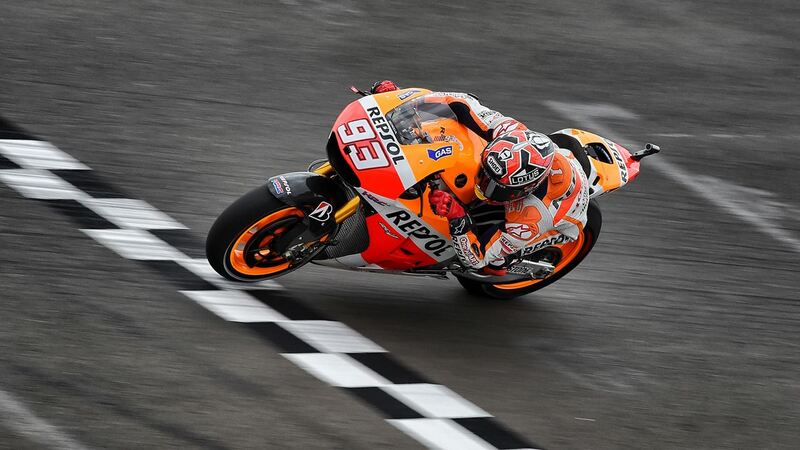 Marquez’s first flying lap in Qualifying Practice 2 was quicker than any of his rivals could manage, but he went even quicker on his penultimate lap to finish to finish 0.742 seconds clear of Movistar Yamaha MotoGP’s Jorge Lorenzo who finished in second place. On the other Repsol Honda, Dani Pedrosa will start tomorrow’s race in third place on the grid with his lap time of 1’38.425 securing him a front row slot. Track conditions improved today with more rubber and less dust on the asphalt providing a slight increase in grip compared to yesterday. The peak track temperature of 42°C was recorded during Qualifying Practice and was an increase of 8°C from yesterday’s high. The better track surface enabled riders to extract more performance from the tyres, with a significant improvement in lap times and more consistent performance over race distance. The hard compound rear slick was the preferred option among the Factory Honda and Yamaha riders, providing more consistent performance while the medium compound rear slick was more popular with the Ducati and Open-class riders. For the time attack in Qualifying Practice 1 and 2, riders used the softer rear slick options available to them, although some riders also set impressive lap times on their harder rear slick option. With three front options available this weekend, front tyre choice for today’s sessions showed a strong preference for the medium compound front slick, although all three specifications were utilized by riders today. The next MotoGP session is the morning Warm Up session at 0940 race local time (GMT -4) with the twenty-five lap Argentina Grand Prix set to start at 1400. “The situation has improved a lot compared to yesterday: we made many changes to the bike set-up and already this morning I felt much more at ease than yesterday. Even the track conditions have improved a lot, but we made a big step forward regardless. Thanks to the good work done on the bike, during the last free practice session I managed to keep a good pace and I was very consistent with the hard tyre, so I’m very confident for tomorrow’s race. Unfortunately, in qualifying I made some mistakes during my fastest lap and there was a lot of traffic, so I have not been able to set a reasonably good lap time. However, tomorrow we can do a good race: I would like to thank my team because they are working hard to help me”. “I’m happy with my qualifying: we checked the split times and it’s clear that my ideal lap time would have been quicker than Hayden. When I went out on track I didn’t push hard enough with the new softer tyre in the beginning: it was my own fault, and it’s a good lesson for the future. Then, I lost the rear a couple of times in my last two fast laps, losing 0.5 seconds in only one sector. All in all, I’m satisfied, but also a little disappointed because Nicky is in front of us. During Free Practice 4 I felt really good and I was pretty consistent with the hard tyre, thanks to a set-up change made on the fron end, so today we made big improvements. Regarding tyres, I think that the only option for the race is the hard compound; anyway, the track is coming better, so is the tyre life, therefore tomorrow’s race could be really interesting for us”.